This page, like several other pages in this series constructed in the lead-up to the 2004 Federal Election, lists some communication from Labor candidates and MP's in relation to our election platform. There are statements from Eden-Monaro's candidate Kel Watt, the Member for Grayndler Anthony Albanese, Nicola Roxon, the Member for Gellibrand, and a news item relating to the Hon Kim Beazley, the Member for Brand. My name is Kel Watt, and I have just been endorsed as the Labor candidate for Eden-Monaro. During my preselection I ran on a very strong Refugees policy, and have been vocal within the ALP about a more humane policy. I was a founding member of Labor for Refugees and helped establish the group within the area. I would be very interested to meet with and listen to local RAR members. Kel Watt, Labor candidate for Eden-Monaro, has called on the Federal Government to give 200 children an early Christmas present this year, and release them from detention centres where they are being held behind razor wire. "The Australian Government currently holds 94 children in Immigration Detention Centres in Australia and 90 in the Pacific. Most have been there for two years," Mr Watt said. "A Detention Centre is no place for kids to grow up. The Australian Government has the power to release these children, and should do so immediately." "The oldest children in detention are living out their teens behind razor wire and electric fences. The youngest is a baby born a month ago, who was placed in detention in Baxter shortly after his birth. "Australia's detention policy of children is out of step with the rest of the world and is unnecessarily cruel," Mr Watt said. "It is unacceptablethat families are being separated with mothers and children housed under guard in houses outside the centre while fathers remain inside. Boys older than 12 have been separated from their mothers and forced to live in the detention centre proper. "The physical, emotional and psychological damage detention inflicts on children is well documented and not in dispute. Some children in Australian detention centres have been unnecessarily imprisoned for years and no longer know why they are held in detention, as they suffer more and more psychological damage. "Under the regulations of the Temporary Protection Visa some families are split, with dependent children stranded in other countries, and their parents unable to find a solution that will reunite the family. These families live in uncertainty, fear and intense anxiety. Their children suffer in ways that would terrify any parent. "In Australia, children are held in detention for years, while in Sweden the maximum time a child is kept in custody is six days. "The detention of children and the Temporary Protection Visa, especially its effect on separated families, breaches Australia's obligations under international conventions and protocols. "This is not how we as Australians want to treat families," Mr Watt said. "The needs and rights of children must be put first. "There should be an immediate end to the detention of children and an immediate change to regulations that enforce separation between parents and dependent children. "Damaging children is not acceptable to Australians, and the Government should show some compassion as we approach Christmas. Release these children from detention and give them a chance at an Aussie Christmas that we all enjoy." "...I will stand up for our local community's needs and will never take a backward step speaking out on what is the correct and moral thing to do on the matter of human rights, especially in the area of refugees and indigenous issues." .."...What I will fight for as a Labor MP: A just and compassionate Refugee Policy, with an end to mandatory detention." "I don't support mandatory detention"
For example on asylum-seekers, my view is very clear, in terms of I don't support mandatory detention, I support the views which I'm sure the people in this room would have a common one on. But unless we actually acknowledge that there are some people who actually don't like asylum-seekers, not just John Howard, then we won't be able to move forward. 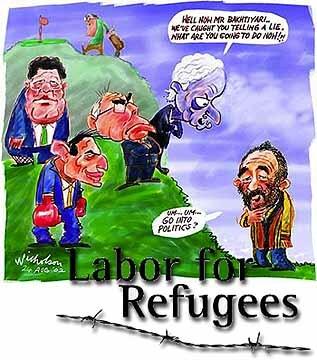 Project SafeCom NOTE: we have serious reservations about the ALP's current asylum seeker policy as launched last year by Hon Simon Crean and Ms Julia Gillard, and in this criticism we join with Labor4Refugees. You can access some of their remarks about the Labor Policy through our web page "The struggle for Labor, the trouble with Labor". We look forward to the January 2004 National Conference, where the ALP will hopefully finally listen to what has been strongly endorsed by the ALP members in most State Conventions around Australia: to abandon the policy of mandatory detention. This week marks two years since the TAMPA came across Australia's horizon and the Howard Government's treatment of asylum seekers became a hot topic throughout every kitchen, lounge room and workplace in the country. Shocked at the audacity of the approach taken by the Howard Government, many Australians welcomed what they saw as a tough and determined stance against people arriving unauthorised by boat. But what has this "toughness" actually delivered, and has its price been worth it? Two years on, and with the benefit of hindsight, we can examine the extremely high - and ongoing - cost, at a personal, national and international level. And we now know the deceit and distortion of the situation that was a central part of the Government's strategy in the lead up to the last election. It is true that two years ago Labor was caught somewhat flat-footed, ill-prepared for the lengths the Government would go to in lying about children overboard and in demonising and promoting fear amongst the community. It is also no secret that these events two years ago heralded an internal struggle within the Labor Party about how to find a compassionate, appropriate and responsible response to the Government's handling of this matter. It took Labor a year's worth of hard work, consultation, research and calm planning - not mention a touch of soul-searching - for us to announce a comprehensive, new refugee and asylum seeker policy. agreeing to monitor the safety of those asylum seekers who have not been able to prove their refugee status and are returned from Australia. These improvements are part of a policy that still maintains a strong, protective approach to our borders through the introduction of a purpose-designed Coastguard. This just mentions a few features of Labor's policy, but they are seen in stark relief to the Coalition when you consider the current plight of refugees and asylum seekers under the Howard Government. Failed asylum seekers are being returned to countries under agreements with Australia that are not publicly available (such as Iran) and where no commitment has been made by Australia to monitor the safety of those being returned. Labor's policy offers a strong and workable alternative to each of these issues. And as each day, month and year since the TAMPA passes we see more evidence of a policy which is not only failing, but is harsh, costly and often cruel. At the time, Minister Ruddock said his policy was aimed at stopping "queue jumpers". Since, we have discovered that it is insiders (like friends and liberal party donors) who are those most likely to be queue jumpers in Australia's immigration system. This arises because it is the Minister himself who has the power to make the final decision about who gets to stay in this country and who doesn't. He has used his power to grant visas where all other avenues have failed nearly 2,000 times since becoming Minister. It is his personal discretion, which is currently being scrutinised by a Senate inquiry, set up as a result of allegations of favouritism, influence and worse. This is another part of the system that isn't working. Labor doesn't believe the plight of individual claims should be decided by the Minister alone, instead we have proposed a Asylum Seeker Claims Processing Review Committee and a more public decision making process. Perhaps as a circuit breaker such an advisory committee could assess the less than 500 people currently held in Australian detention facilities seeking asylum? This process would avoid the current secrecy and potential for favouritism built into the Minister's discretion. It might also give the country a chance to clear the slate and start again. Two years is long enough. It is time for the Australian government to chart a different course. Bomber Beazley is preparing for another bomb run. He's on the tarmac at Perth, revving his engines, about to taxi and take off. Another dash across the Nullarbor, loaded with bunker busters to dislodge Simon Crean. Already, Mark Latham is collateral damage. Yes, it's on again, Kim Beazley's campaign to recapture the leadership. The first sign: last week's shelling of Latham. Not only does Latham represent Crean's first line of defence but, of course, come another coup he'd be a contender. Thus the Bomber's boys - Labor MPs Wayne Swan, Stephen Smith and The Australian's columnist Michael Costello - started lobbing mortars at the shadow treasurer. The plan? To give the Bomber a clear run to Crean's headquarters and, when the smoke clears, there'll be just one man standing - looking magnificent in his leather coat and goggles, arms akimbo, the mighty Kimbo. While he has been busy filling his bomb bay, Beazley's intelligence gathering has reached a frenzy. In the op room the phones are running hot, and there has been a lot of pointing at maps and counting, counting, counting. They think they've got the body bags for Crean and his closest aides pretty well stitched up. This appears delusional. The caucus is so fractured and factionalised that the Whopper is likely to come a cropper. Evidence that Beazley has found another shot for his locker comes from his warning, at the weekend that Australia's surrounding waters are brimming and bobbing with fishing boats - with fatter fish to fry. This armada is riding low in the water because of holds full of terrorists. Beazley has demanded that Amanda Vanstone personally search every vessel. Even a Government that relies on border-protection issues to win elections has thrown up its hands - or, rather, Amanda has thrown up hers. She points out that we haven't got a coastguard (recall that this was Beazley's big idea for the last election) and that even the most sophisticated surveillance technologies can't X-ray shoals of little ships. So here we are again, back in the familiar pre-election waters you'll recall from the Tampa asylum-seeker stand-off, both sides of politics fuelling our fears. Certainly the car bombings are getting closer: Iraq, Turkey and, yes, Bali. But this time Beazley won't be outflanked. He's not only upping the border-protection ante but attempting to claim the issue for himself. It's likely, even inevitable, that Australia will have a car bombing on its soil. The first targets will be diplomatic postings in the region, but we will cop it here - particularly if we issue French terrorists with visas and allow them to marry into our armed services. But why would a terrorist arrive in a leaky boat when he can fly in business class? As both history and recent events demonstrate, however, fear is the politician's best friend. And if the Prime Minister can say "Boo! ", Beazley is going to show that he can say "Boo!" even louder. In such a campaign, hapless refugees will be the first casualties. Beazley has no intention of rocking the boat on mandatory detention - and his boatloads of terrorists will harden public attitudes. This, in turn, would set up interesting tensions with his West Australian colleague, new party prez Carmen Lawrence. So here's the plan. Swan, Smith, Costello and the rest of Beazley's advance team will dispose, simultaneously, of Crean and Latham. Then they'll turn the attack on John Howard. No, it won't involve the vision thing, bold attempts to inspire the electorate. Apart from border protection, Beazley has never been all that excited by policy and his apparatchiks remain poll driven. So we'll have a real ding-dong as both sides of politics try to outdo each other in the war against terror. I've always believed that Beazley would have been an even more willing member of the coalition of the willing than Howard, that his passion for military history would have had him wanting to make it. So it's odds on we would have sent even more troops to the Middle East had Beazley been PM - and it would have been him having the photo ops with George W. Bush and Tony Blair. Talking of Bush reminds us that Crean, when feeling confident, can do pretty well. He got good press for his speeches during the Bush visit and I'm reliably informed that even Bush was impressed. But when Crean feels beleaguered, his performance drops. Any analysis of the polls shows that although Labor's primary vote looks crook, the two-party preferred signifies a threat to Howard's third term. One might have thought that making the best of it with Crean, showing him a modicum of loyalty rather than constantly demeaning him, might have been a sensible tactic. Then Her Majesty's Opposition would be poised for victory. Certainly the landing of the Kurds on Melville Island hasn't played anywhere near as well as did the reffos on the Tampa - and Howard has yet to defuse all the domestic problems (health, education, the dollar, the deficit and the interest rates), which is why the PM will be cheering on the Beazley team - that's when he's not laughing. Having dispatched Beazley twice, thrice shouldn't be too difficult. But Kevin Rudd - he'd be a real challenge.